We have developed a reputation of doing things that others cannot, or will not do. If you have a piece of furniture and need a matching piece making or if you have had something damaged and need it repairing we are able to help. As timeserver and experienced cabinetmakers we can make things in real wood. Our furniture becomes your family heirloom, built to last and stand the test of time. 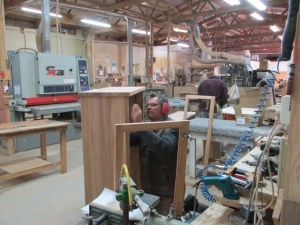 We can manufacture items from Rimu, Kauri, Oak, Beech, in fact any wood you wish. We can and do make a lot of furniture from recycled timber, giving the precious resource a second lease of usesfull life. Another aspect of recycled timber is the deepness and richness of the grain. If you would like to know more, please call us to discuss your needs, we are happy to give you advice on the best way to make your desired furniture.